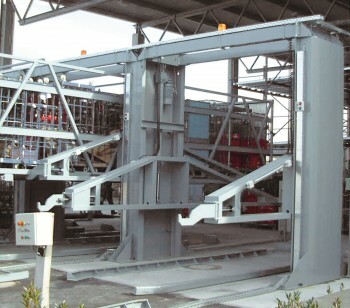 A logistics company was looking for a suitable solution for the loading of trolleys. The special feature of the solution should be such that the carts should be shipped in large quantities over several floors and if necessary on a truck. For loading the trolley a loading device was constructed with a complete ramp could be promoted to a certain height and unlatched when needed and silt on a truck. To raise the ramp over several floors, there were used two EH4 High Thrust Linear Actuator with ball screw spindle and electronically synchronization.